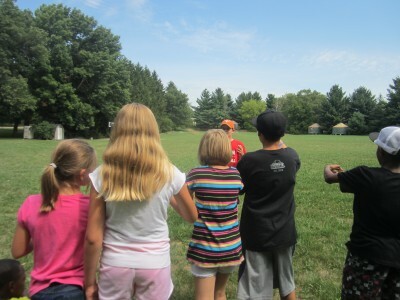 Campers participate in team-building exercises at Lutherdale Bible camp in Elkhorn, Wis. The faith-based camp hosts nearly 1,000 campers every summer including Lakshmi, a Bhutanese refugee. I look at the sheet to start learning the names of the girls who’ll be in my cabin the next few days. I do this every Sunday afternoon of summer Bible camp in Wisconsin. Jessica, Sydney, Paige, Morgan, Claire. Lakshmi*? Not the usual name. I say it out loud. Karin, one of my coworkers, tells me a little bit about the girl Iâ€™ll be responsible for. Lakshmi, she tells me, was born in Nepal and lived in a Bhutanese refugee camp before moving to the United States. The third grader now lives near Madison and attends the same church as Karin. Lakshmi arrives with the rest of the campers that afternoon. Her long dark hair hangs straight almost to her waist, her dark olive skin a stark difference from the Scandinavian-background Lutheran children who populate the camp. Karinâ€™s mother accompanies Lakshmi to register her and help her find her cabin. She pulls me aside in the cabin while Lakshmi and the other girls settle in to tell me that this is Lakshmiâ€™s first time away from her family. She cautions me that Lakshmi might act reserved because she is self-conscious about her English. I make a mental note, but the Lakshmi I witness that week at camp is anything but shy and quiet. Lakshmi lives with her parents and five sisters. At eight, she had responsibilities around the house to help her mom take care of her younger siblings and keep the place running. Camp was the first time Lakshmi had her own bed and place to call her own. Karin tells me this. The other campers in my cabin donâ€™t know any of it. The topic of family and home rarely comes up between the girls and me during our busy camp days. Lakshmi gets along great with the other girls in the cabin and loves everything from swimming to bedtime. I hear her singing along to the camp songs with only the slightest twinge of accent. Her smile is infectious and she rarely complains. She’s not a camper who laments, â€œIâ€™m tired, Iâ€™m hungry, my feet hurt.â€ She often asks in a gravely deeper-than-her-age voice, is it time to go back to the cabin because, I figure, she loves having a bed all to herself. Lakshmi tends to her bunk and our cabin, often chastising other girls for having their belongings all over the place. I keep forgetting that she comes from a different background than the other girls in our cabin; sheâ€™s like any other 8-year-old at camp, sassy when she has to do something she doesnâ€™t want to do and entirely excited to experience life apart from the familiarity of her parents. At the time, I was too busy to really think about how significant this experience was to me. As I think back on that short half week of camp, Iâ€™m amazed with how completely typical Lakshmi was. When I remember back, I realize that she didnâ€™t necessarily blend in but she became part of the bigger group dynamic. She had a funny personality that made me giggle to myself during Bible study when she said something adorable. Lakshmi didn’t get homesick. I didn’t have to treat her any differently from the rest of the girls with the familiar names. She adjusted well, overcame the language challenges. Was this what she was like when she wasn’t at camp? Lakshmiâ€™s energy and love for camp gave me such joy as a cabin leader. She reaffirmed for me why I’m at camp in the summer: to help every kid, no matter what was happening in their personal lives, have the best experience. Coming to a new place and being away from parents for the first time is a breakthrough for every kid. Being able to guide that passage is my reward. Lakshmi’s my reminder .